East Dorset, Vermont – Nineteen-year-old Cormac Hanley (IRL) and his own Captain Caruso cruised to their first win together in the $10,000 NYDJ Welcome Stake, presented by Manchester Designer Outlets on Thursday, July 28, to continue week four of the Vermont Summer Festival in East Dorset, VT. The Vermont Summer Festival runs for six consecutive weeks at Harold Beebe Farm from July 5 through August 14. With several top finishes together, including three second-place ribbons in Saratoga earlier this year, Hanley and Captain Caruso had never led a victory gallop until Thursday’s competition. From an original field of 21 entries, Hanley and Captain Caruso were the only double-clear pair over tracks set by 2015 Pan American Games course designer, Michel Vaillancourt of Canada. 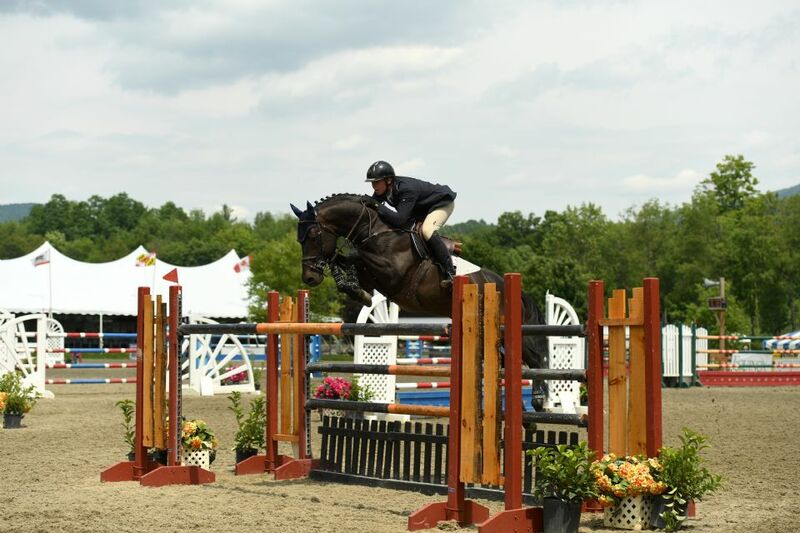 Manchester Designer Outlets, on July 28 at the Vermont Summer Festival in East Dorset, VT.
Four horses advanced to the jump-off with Hanley finishing clear and fast in 32.67 seconds. Ian Silitch of Ocala, FL, had the winning time, but pulled a single rail to finish on four faults over the short course. He and Cordovo, owned by Gaston Family Investments, LLC, took second. Agatha D’Ambra of Rexford, NY, piloted Ca Va Bien to a four-fault jump-off in 39.30 seconds to finish third for Trade Winds Farm, and Whitney Lyon claimed fourth aboard Constara, owned by W Show Stables, with one rail and three time faults in 42.82 seconds. Mark Jungherr of Amesbury, MA, and Conte Couleur, owned by Ronald Francoeur, rounded out the top five with the fastest four-fault score from the first round. Hanley, who rides for John Brennan and Missy Clark of North Run based in Warren, VT, has had the ride on Captain Caruso for roughly three years. The ten-year-old Irish Sport Horse stallion (Captain Clover x Caruso) is one his father Charles bred in Ireland. “We have a really good relationship,” said Hanley. “He knows me inside and out, and I know him very well. He has a great temperament, and he is so quiet for a stallion. There is never any fuss with him. Hanley joined the North Run team in the fall of 2015 and is spending his first summer at the Vermont Summer Festival with plans to point Captain Caruso toward grand prix competition during the next three weeks. by Manchester Designer Outlets store representatives, Caroline Roberts and Tessa Gould. 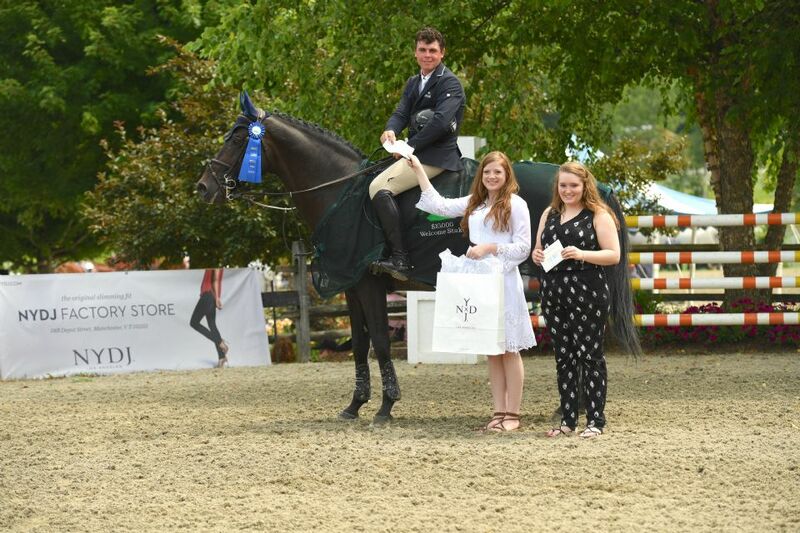 In addition to his share of the prize money and a commemorative scrim from Mona’s Monograms, Hanley was presented with a $1,000 gift card to the NYDJ outlet store in Manchester, VT, from Caroline Roberts and Tessa Gould, representing the Manchester Designer Outlets. For over 20 years, the Vermont Summer Festival has attracted exhibitors and their families to the Manchester region in southern Vermont for great competition in an ideal summer setting. Outside the show ring, exhibitors are immersed in the charm of Vermont’s shopping, dining, and outdoor activities.